Wild Mountain Music was formed as a partnership between Shonti Elder (fiddler) and Will Putman (guitarist) in 1987 to record and distribute original Alaskan music as singer songwriters. The music combines a variety of acoustic styles based on bluegrass, celtic, and traditional American fiddle music. 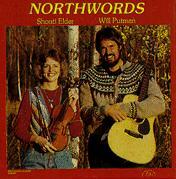 Wild Mountain Music also produces concerts and has created a catalog of Alaskan folk artist's and their music. Contact us regarding Wild Mountain Music, our recordings, or information on the Catalogue of Alaskan Artist's see below. Recorded in 1987, Northwords is the result of years of folk festival collaboration and a strong mutual admiration of each other's musicianship and song writing ability. The style varies from bluegrass to ballads to traditional fiddle tunes applied to a truly creative batch of original songs and tunes. Available on cassette and LP. Snail Mail: send $15 for CD's, $10 for cassettes or albums. Add $2 for postage. Make checks payable to Trill Music.